The Rovers lined up unchanged and the Jags had ex-Rover back-up Andy McNeil in goals. The Rovers attacked the goal facing the sun first half as the Raith fans squinted at the park or sat as if saluting while those with hats and shades hid their smugness. The home side are fleet of foot and Russell reminded the Rovers of this in the first minute getting into the box but Mensing was alert to cover. 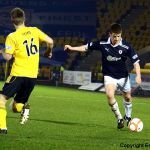 The Rovers speedster Grant Anderson took an early knock from a heavy challenge and required treatment. The Rovers started brightly but didn’t fashion a clear chance. Wee Scougall did well to get a shot off from just outside the box but McGurn did better tipping it wide. This stirred Livvy’s drummer who like their fans had been silent until that point unlike the vocal and entertaining Rovers support. 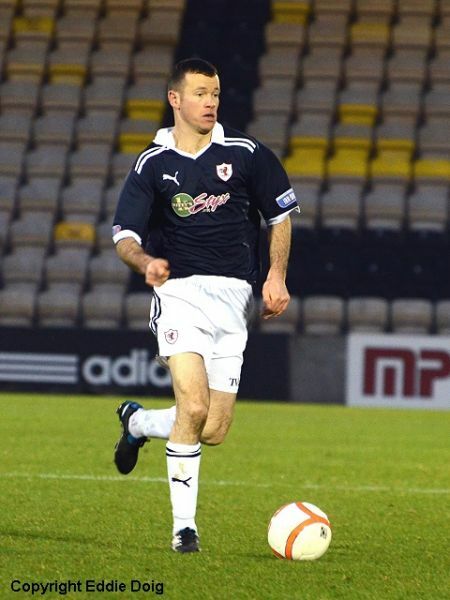 In the 15th minute Stuart Anderson again showed his quality with the ball teeing up Graham 14 yards out. Brian shot on the angle and McNeil surprised a few in the crowd by tipping the effort over. A more fortuitous chance fell to the home side when a deflection fell very kindly to Andreu but McGurn did well to push his drive away. 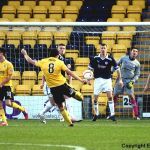 As both sides pushed for the opener the Lions saw a header go past, a Thomson cross was knocked wide with Graham poised then a home man shot into the side netting. Thomson and Grant Anderson ran into each other going for a high ball but neither were hurt if perhaps a little embarrassed. Livvy were having more of the play and McGurn saved after a corner before McNeil pushed away Graham’s free kick round the wall. A long ball forward set up the opener, a homeman was onto it wide and the Rovers defence were pulled over leaving Russell at the back post where he bundled the cross home in the 28th minute. 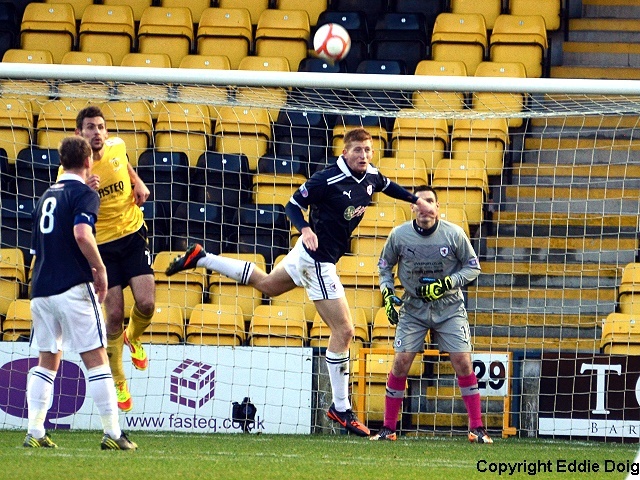 The Rovers reply was almost instant but Graham’s shot after good play was blocked. 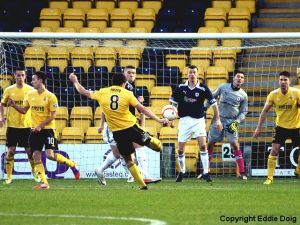 Clarke, who was putting in a good shift, set up Graham but his chip was too strong beating McNeil and going over the bar. The exotically named Jesus Garcia Tena at a free kick was all over Hill in the box before the ball was played in then again as it was delivered. Graham was not distracted by this and his low effort was just stopped on the line by McNeil. 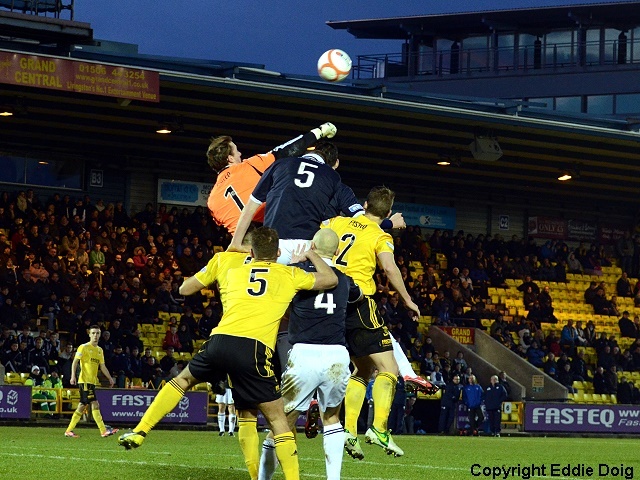 The Rovers equaliser wasn’t denied much longer. A ball in was cleared by the under pressure home defence but played back in again, Clarke’s first time drive deserved a goal but McNeil half blocked it before the ever deadly Graham reacted quickest putting rebound past the despairing keeper. 1:1. Livvys good one touch passing saw them create a chance for Andreu who shot wide from 26. 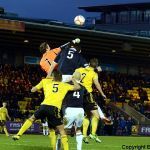 Graham beat McNeil again after Clarke gave him the ball in space but Brian’s shot from 27 yards hit the bar and went over… A home defender at the back post nearly bulleted a panicked clearance in and the home side were relieved to see it go past. Garcia Tena fouled and was rightly spoken to though he was more than a little dismissive of the ref’s opinion. The half ended with the home side failing to turn a couple of half chances into goals. As the sun dipped out of view the Rovers support spent some of half time digging out gloves and doing up jackets. Garcia Tena cleared an early Rovers threat then Iain Russell remained on his feet running into the box before seeing his effort cleared for a corner. Garcia Tena up for a corner wormed his way into the box and his low cross was deflected kindly to Barr who fired home from 6 yards. 2:1. 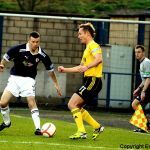 Hill and Staurt Anderson were booked for only the Rovers 4th and 5th fouls of the match around the 50 minute mark. In the 51st minute Smith who’d had a quiet game got wide and his good cross hit the trailing leg of a defender and went away from goal harmlessly summing up how things were going for the visitors. Garcia Tena clearly impeded Graham just outside the box, Malone’s free kick hit the wall and went wide. Booth was rightly booked for felling Grant Anderson. In the 65thafter another home foul Walker’s free kick curled just wide with McNeil again struggling. Garcia Tena was penalised again without further action being taken. Clarke then saw his good front post header whip across goal just above the bar. 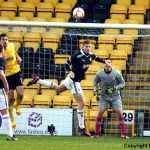 The home side still looked dangerous using their pace but McNeil was tested again when Walker shot after good play was taken by the former reserve Rover at the second attempt. 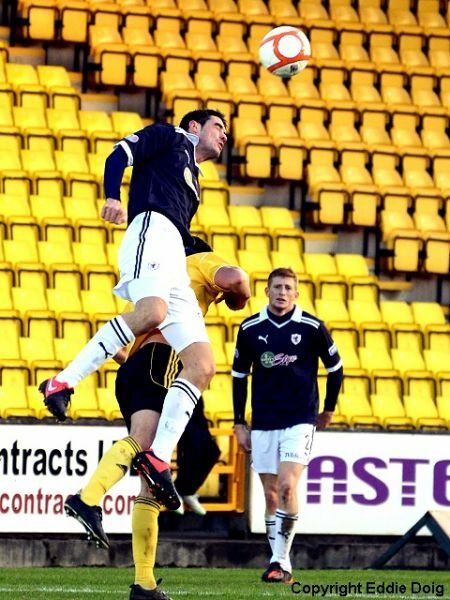 McGurn pushed away a good long range effort from sub Morton who tried again a couple of minutes later. Stuart Anderson was replaced by Hamill with 11 minutes left but Joe failed to make any impact. 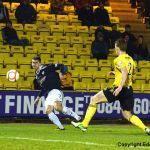 Scougall was given space in the middle at an innocuous free kick and his run and low shot was equalled by McGurn’s save. 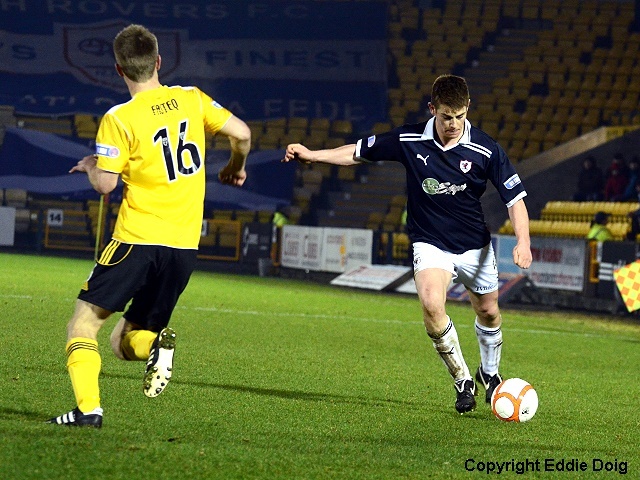 As time ran out the home side wasted some time infront of the Raith support. Both sides had final breaks but neither capitalised. Russell is the first to test McGurn. McNeil intercepted a Walker cross. An O'Brien shot goes over the bar. 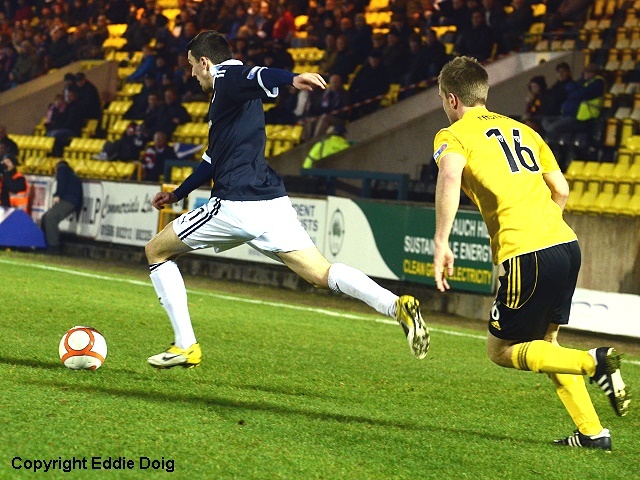 Scougall forces McGurn to concede a corner with an eighteen yarder. 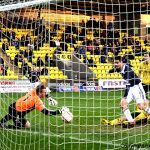 Graham forces McNeil to make a finger tip save for a corner. AAndreu brings out the best in McGurn with a rasping 18 yard shot. Good footwork by Thomson sees his cross go out for a corner. Mensing showed class in defending a high ball. Russell tests McGurn again, the latter prevails. Grant sends A 25 yard free low and right, McNeil punches clear. Russell from just inside the box. Graham chips the ball 20 yards out but goes over the bar. Clarke is denied from inside the six, McNeil stops on the line. The first shot from Clarke is blocked, but Graham follows up from three yards to score. Andreu shoots wide from outside the box. Graham rattles the bar with a shot from 25 yards. Tena spoken to by the ref. Tena's cross isn't cleared and Craig Barr scores from 7 yards out. McNeil, McCann, Booth, Tena, Barr, O'Brien, Andreu, Fox, McNulty, Scougall, Russell. Subs, Morton, Fordyce, Mullen, Jacobs, Jamieson. McGurn, Thomson, Malone, Mensing, Hill, S. Anderson, G. Anderson, Walker, Graham, Clarke, Smith. Subs, Spence, Hamill, Ellis, Donaldson, Laidlaw.